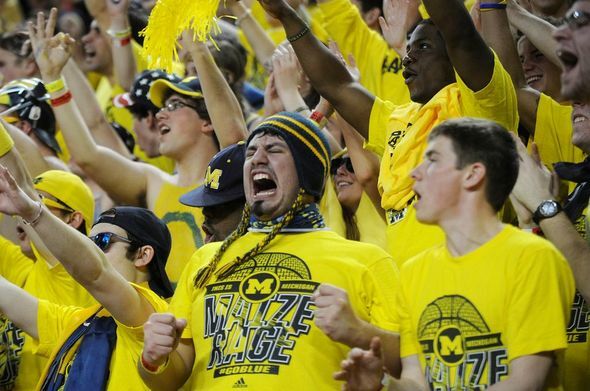 Posted on Sun, Feb 19, 2012 : 12:46 p.m.
Members of the Maize Rage react to a Michigan basket during a 56-51 win against Ohio State on Saturday. The Wolverines are unbeaten at home this season. This stuff didn't happen four years ago. When Michigan basketball co-captains Stu Douglass and Zack Novak entered the program prior to the 2008-09 season, the biggest advantage derived from playing home games came from the ability to sleep in your own bed the night before. But hosting teams in front of a raucous home crowd? "What home crowd?" Douglass asked rhetorically Saturday. So, forgive Novak or Douglass if they had to take a moment to believe exactly what they were seeing prior to Michigan's 56-51 win over Ohio State on Saturday. Some 10 minutes before tip, before the national anthem, before anyone ran through a tunnel, Crisler Center was more lathered up than it had been all season. Than it had been in years. Not one seat was empty, yet no one was sitting. Ever wonder what 12,721 red-faced, pompom-waving, maize-covered fans sounds like? Well, it's less of a sound, and more of a vibrating rumble. "You've got to pinch me," Novak said afterward. "This is unreal." Four years ago, Michigan was coming off a 10-22 campaign and hadn't seen an NCAA Tournament in more than a decade. Playing in an outdated arena, the 2008-09 Wolverines -- who would eventually snap the school's tournament drought -- played their first game of the season in front of 6,328 people, less than half the capacity of Crisler Arena before its renovation. There were no lines wrapping around the building, no pompoms and no star quarterbacks leading cheers from the student section. "Nothing against our fans, because our fans are great and there have been some loyal fans," Douglass said. "But nobody wants to root for a bad team with a losing record, which they had before (Novak and I) had got here." The same Michigan basketball team that couldn't give tickets away four years ago hosted a day-long, nationally-televised commercial by ESPN before welcoming in the two-time defending Big Ten champions in front of the program's seventh sellout crowd of the season. 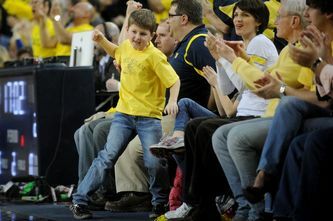 A young Michigan fan reacts to a Jordan Morgan dunk. Only this team isn't the same, because when the rafters of the Crisler Center began to shake from the noise moments before tip off, the team on the floor didn't just hope to beat one of the nation's top clubs. "Crisler wasn't rocking like this ever, not that I can remember," Novak said afterward. "And rightfully so, the program had been struggling. "It took a lot of hard work, but I think it's getting back to where it needs to be." No opponent has survived Crisler Center this season. Not one. Wisconsin got blasted by 18 points. Michigan State made a valiant charge, but ended up falling by a point. And now, Thad Matta and his bevy of prep All-Americans can officially add their name to the list. Michigan is 15-0 in Ann Arbor this season, and sits one win away from grabbing an unbeaten home record for the first time since 1976-77. Add in the fact that the Wolverines also entered Sunday just a half game out of first place in the Big Ten, a league they haven't won in 26 years, and Michigan basketball coach John Beilein and company have plenty of reasons to smile. "When I (got to the arena) at 6 a.m. this morning, I said 'is there going to be 40 or 50 people here?'" Beilein said. "Sure enough, the line wrapped all the way around the football stadium. "We're getting this thing going in the right direction." With four games left to play, the Wolverines have a shot at a Big Ten title, a raucous home atmosphere to lean on, a lofty national ranking and a shot at a deep run in March. Well, that stuff just didn't happen. Mon, Feb 20, 2012 : 5:21 p.m. Seeing Crisler like it was Saturday is fantastic. That's the way the atmosphere SHOULD be in there for a college basketball game. I remember back in the 1980's I'd see so-called fans sitting in there reading the Wall Street Journal and NY Times. It was like a theater with very little energy. Most of the students were relegated to the rafter seats. I also remember that 1976-77 team. What a run they made that year, going most of the season ranked as the #1 team in the country. Unfortunately, it wasn't enough to land Magic Johnson, which I still haven't gotten over as a fan! Sun, Feb 19, 2012 : 10:29 p.m. The 2011-12 season on home court has made it's mark. Signature wins over the Spartans and ohio were big hurdles to clear this year. Thanks to all the fans who were the 6th man on the court all season. Sun, Feb 19, 2012 : 10:01 p.m.
Until this article, nobody has had the courage to call us fair weather fans. It is what it is. A blinding flash of the obvious in fact. Thank goodness we are experiencing fair weather these days. Go Blue! Sun, Feb 19, 2012 : 9:58 p.m.
Mon, Feb 20, 2012 : 4:56 a.m.
Sun, Feb 19, 2012 : 9:35 p.m.
Did MSU make a valiant charge or were they humbled??????? Mon, Feb 20, 2012 : 3:24 a.m.
See Feb. 5 and current standings for update on &quot;humbling&quot;. Sun, Feb 19, 2012 : 10:13 p.m.
Sun, Feb 19, 2012 : 9:10 p.m.
Sun, Feb 19, 2012 : 11:48 p.m.
Sun, Feb 19, 2012 : 11:08 p.m.
Sun, Feb 19, 2012 : 8:27 p.m.
Terry...you've got a problem there in Ann Arbor! 23-0 at home...and STILL CAN'T CATCH THE MSU SPARTANS! What's it gonna take? LOL! Mon, Feb 20, 2012 : 5:18 p.m. The days of Izzo dominance in Michigan have reached the end. From here on, another team is going to be doing the chasing. Sun, Feb 19, 2012 : 11:06 p.m.
Sun, Feb 19, 2012 : 10:24 p.m.
Sun, Feb 19, 2012 : 6:47 p.m. The Big Ten home court advantage is remarkable this year, and Crisler Arena, much like the Big House (23-0 both teams at home) is daunting for the visitors - particularly if your a buckeye. First your team gets smoked in late November at the Big House, your state is out recruited (11) by the mighty Hoke for 2012 and the new recruits are standing at the border trying to get a ticket for 2013 and finally, you bring an overrated #6 team up Saturday and get manhandled all over the court making for a long ride down south. Great time to be a Wolverine, horrible time to be a buckeye - and it gets worse.... MgoBlueForTiM.......the devil wears red and he went down..